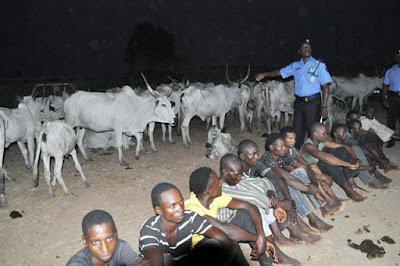 A military patrol team from the 20 Mechanised Battalion, Serti operating in Mambilla, Taraba State, on yesterday paraded six suspected cattle rustlers nabbed while cow sharing meat in Nyogor forest. According to Lt. Col. Sani Adamu, the Commanding Officer of the Battalion, 30 cows were also recovered from the suspects who were paraded at Mayo-Ndaga, near Gembu, in Sardauna council area. The suspects, all men, included Hammanjulde Yahya, 50, Umaru Yahya, 40, Paul Samuel, 35, Juli Adamu, 30, Ibrahim Yusufa, 27, and Usumanu Buba, 25. He explained that the soldiers were patrolling the trouble area, where several people were killed and hundreds of cows stolen in early March, 2018 when they got hint that the suspects were in the forest.